While Shantae will likely always be the series WayForward is best known for, its Mighty series has enjoyed a sizeable degree of success on Nintendo's DSiWare service. 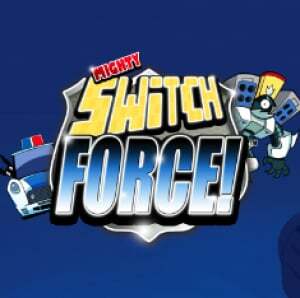 Now, the developer is looking to carry that success over to the 3DS eShop with the release of puzzle-platformer Mighty Switch Force. While the game is once again quite different from its predecessors, its unique gameplay and art style make it every bit as original and engaging. In Mighty Switch Force, you take charge of Officer Patricia Wagon. Your task is to round up all five of the escaped Hooligan Sisters and then make it to the extraction robot in order to complete the level. Since these sisters aren't too keen on being captured, they'll attempt to hide from you in strategic locations around each level. To reach them, you'll have to navigate your way through a host of platforming challenges, along with a barrage of enemies bent on stopping you. While there is certainly quite a lot of platforming to be found throughout Mighty Switch Force, it's the puzzle aspects that give it such a unique spin. You'll still spend a considerable amount of time running, jumping, and shooting your way through levels, but it's the switch mechanic that forces you to don your thinking cap on from time to time. There are a host of different block types, each with their own unique set of characteristics. Some are just regular blocks that can be switched in and out of the screen for you to walk upon, whereas other blocks can shoot you off in specific directions or be screwed into the screen so they will remain intact even after you press the switch button. It's this variety of blocks that gives the game its unique puzzle elements and will require you to to use the switching mechanic at very specific times. You can even use these blocks to manoeuvre or destroy enemies, which will be required at times in order to progress through the level. There are 16 levels — or "incidents" as they're labelled — for you to tackle. While this might seem like a small number, many of these levels are quite lengthy, especially when you factor in the time it will take you to solve the puzzles. As you beat levels, new ones will unlock. You'll even be timed in each level as you shoot for the rather strict par time, yet another reason to go back and play levels again in order to earn the blue star that comes with finishing under par. As with most WayForward releases, controls are perfectly responsive and very well thought out. Even when you find yourself jumping, shooting and switching in rapid succession, there's never even a slight hiccup in the intuitive control scheme. Add in intricately-crafted level designs and you've got not only a solid level of challenge, but also all the tools with which to beat them. When it comes to visuals, very few developers have quite the magic touch with sprites that WayForward exudes. Not only are the characters and enemies animated to perfection, but the backdrops show a stunning amount of detail and superb palette choice. Combine this with the amazing 3D depth and you have a visual presentation that's as good as we've seen on the system to date. The game might be a download title, but it features a stunning level of polish more akin to that of a retail release. And if you think the screenshots are gorgeous, wait until you get a look at it in full 3D. 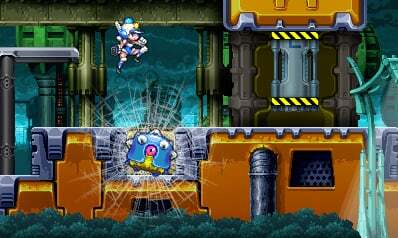 To help drive the intense platforming action there's an upbeat musical score with a techno-influenced style. The music might seem an odd fit at first, but you begin to see just how fitting it is when packaged together with the offbeat visual style the game employs. To further add charm, there are also a host of voiced dialogue snippets and impressive sound effects that liven things up quite nicely. 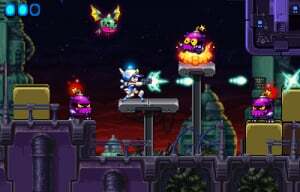 As impressive as its first two previous Mighty releases are, WayForward has managed to kick things up a few notches with this third title. Not only is the switching mechanic extremely well implemented, but the visual and musical presentation the developer has moulded around it is equally amazing. Mighty Switch Force is easily one of the best games WayForward has crafted and just the type of top-tier 3DS title Nintendo's eShop has been in dire need of. I would get it instantly tonight, but... I ran out of eShop money. Here's hoping I get an eShop card for Christmas! Great review Corbs and just in time for the game's release today. I was already planning on buying this game but this review has further cemented my decision to get it. I am really looking forward to playing it. Only a few more hours to go! too bad i can buy this with club nintendo coins i have no money. Yeah i think this is just a must have ! I really need to try this series out. All in favour of Nin buying WayForward as 1st party dev (similar to Monolith) say aye. Aye. will top up in morning and get at 2oclock.looks like a classic got days mixed up will download in morning. Somehow I had missed that this was for 3DS. Now I really want it! HypeTrain has left the station. Christmas comes early! That's another chunk out my eshop budget and another chunk out of my spare time. Sweet as! I can't really wait for this game, it's just so great _ hehe. Somebody knows the exact hour the eShop updates with the new stuff? I've been trying since yesterday but still the same content of the past week! I think Nintendolife reviews of Wayforward games are a bit off at times. Possible bias, but hey - their reviews. The eShop in NA updates every Thursday at 12 Noon Eastern Time. That would make it 9am Pacific time. @12. aye! i love wayforward's style. very much reminds me of the 90's style video games from way back then. plus, of course they made the excellent aliens infestation for the DS. Has everyone in the UK's eShop updated? It usually updates at 2 but now it's 3 and nothing new has been added. All thats been changed is the news, telling me what has become available today (even though nothing has), and a Spotpass about MSF. I really hope Nintendo comes up with a better SD card solution for the DSi because I prefer to play my DSiWare games on my bigger DSi XL screens. Hmmmm, I may pick this up later today then, even know I didn't like the look of the game much originally. reckon they'll reduce the silly price for Shantae now?? Which one is better, this or Pushmo? I want to get one of them but can't decide between the two. I normally dislike Wayforward games, but the bits of music I've heard from this were seriously good! At the very least, I'll seek out the soundtrack. Seems far too short after the first five levels out of the way in under 10mins.. but that could just be me jumping to conclusions. Great review, but another pass. I know WayForward is a great developer; I just wish they would make more games that appeal to me. I just finished downloading the game, and I can't wait to get started! Also, is it just me or Nintendo loosened their size limits? The game is well over 1000 blocks big! This is the largest downloadable game I've seen so far. Yup, it's a big one! Is it me, or is NL just madly in love with this series? The gameplay is hardly original, the charcters are forgettable, and the "replay value" is tedious. I considered the first game to be one of the worst DSiWare purchases I've ever made, and this website made a large impact on me getting it in the first place. This is Tied with Pushmo for my GOTY. Looks like Wayfoward can sweep the nintendolife awards. Wow, this game is one HUGE download! It took a little over twenty minutes for me to finish downloading it. Seriously, not kidding! It is a really huge download! After playing for not too long (30 minutes) I think the 9 is not deserved. It's a very solid controlling and good looking game, but more like an 8 (or a high 7). I'm enjoying Pushmo much much more (it's honestly in a different league I think). 9s are a premium to me, Switch Force appears to be more in the category of "very good, but not amazing." Sort of regretting the download . The banner is tempting me to ge this. So is the glowing review. Now I just need to get more money in my eShop wallet for Colors! 3D, Dillon's Rolling Western, and Sakura Samurai early next year. Just out of curiosity how big is the size of this game in MB anyone know? because its taken significantly longer to download than any other game ive tried. Ahhh 200MB i was guessing its over 150mb just by the amount of time it took, WOW THANK GOD that Crappy download limit is gone from the 3DS at least, no more strangling the developers vision. Shame they never done that for the Wii or DSi it made no logical sense to me. Stop ruining these otherwise awesome downloadable platformers with these puzzle gimmicks! I don't want to think too much while playing platformers! Agree with BULBASAUR but still getting it nonetheless. I agree with pikky. Tomorrow I'm going to buy myself a bigger SD card. Patience Bulb. Mutant Mudds is coming early next year. Any Idea what's next for Wayfoward and the Mighty Series. Yeah going to updrade to a 32GB SDHC next year. @33 Almostnacho: NL is not the only one. The Mighty games have gotten favorable reviews across the board. It's not NL's fault your taste in games differs. @Bulbasaur: With out the puzzle mechanics this game would not be fun. After all platformers have puzzle mechanics of some sort. You have to think about where to jump, when to jump, ect. Anyway this is suburb game. Everyone should download this one immeadiently. What you be talking about puzzle mechanics in platformers is great, using your brain is fun. Crap, this game is addicting. I've replayed every stage 5 times to improve my score. This review is spot on about how charming and well crafted this game is. I finally have a reason to use the 3D on my 3DS, too. They're not exactly gimmicks, they're as important to the gameplay as jumping. If you don't want to think, that's fine, but still, the puzzle mechanics far from ruin the game. I:o < My face when i see the article. Then when I click it ;:I. I thought it was a racing game. Oh well I like Platformers. 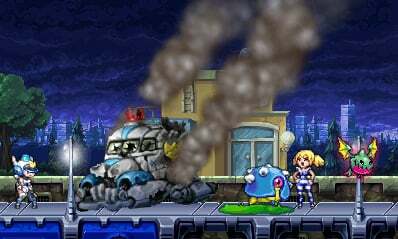 @47 Mutant Mudds is just another one of these puzzle platformers. Whatever happened to more straight-forward platformers like Jett Rocket, Dark Void Zero, or Castle of Magic? @49 Those are platforming mechanics, and obviously any video game requires some thinking. The problem is when they put too much thinking in the more action-oriented genres. @51 Gimmicks and importantance aren't mutually exclusive. In fact, gimmicks are usually pretty important in order to be noticed as gimmicks in the first place. Mutant Mudds is not a puzzle/platformer. It's all platforming, far more so than Dark Void Zero or Castle of Magic, that's for sure. ITS GREAT! The 3D is some of the best i've seen!. I recommend this game, and I'm someone who doesn't like megaman and crap like that! I greatly enjoy this series and am getting an eShop card today for it. But I'm wondering what I should do with the remaining $14's. I would love to see a Smash Bros. type game from WayForward for download in the eShop. Like a cross over of Shantae, Mighty Flip Champs, Mighty Milky Way, and Mighty Switch Force. 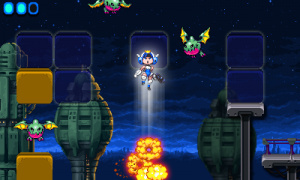 It would be fun to fight each other with characters like Shantae, Wagon, and the little Tinkerbat guys. They could have the giant T-Rex guy murdering people in a level and other levels involving each of the different games. It would be called Mighty Fight Land! or Mighty Murder Mayhem! Hmmm, I don't know. go to the 3dsware forums and ask for a recommendation in the eshop recommendation thread. Great game, I 100% it earlier today. But the file size of the game bugs me a lot, because I can't find any good reason for it being over 1000 blocks. It's rather short (about 2h 40 min 100%), shorter than WayForward's earlier games. And if we compare it to Pullblox which has over 200 levels and is only about 150 blocks, something is really off. Why do you think super meat boy never hit the wii when it was the lead platform. Just wondering, is there a soundtest or gallery for beating the game or getting par on all the levels? Not sure but the sound track is avaible for free download. Wow... the Mighty series has yet to fail. I have got to scoop up this series up when I get a chance. This game is so great, the 3D is utilized in a great way! Definitely will be picking this one up soon. Nice review! I'll download it when I have some e-shop cards! BOOM, looked nice glad it played nice. Way Forward do it again. Great review @Corbs and spot on as usual. I'm really enjoying the game and I really enjoy the puzzle light/action platforming gameplay that's on-hand here. This came out in Aus too, so will definitely be getting this when I'm back from holidays. I love MSF! Thanks for the review, Corbs! 200 MB file size! 1619 blocks! Well, it looks like the download size limit has been lifted. This game is absolutely awesome! I didn't like this game at all. The puzzles were fun, but the platforming was too hard. It did nothing but frustrate me, which made the overall experience very not fun. eShop has some really must have titles, I like it! You would be a fool not to get this game at that price. I consider it well worth its original price. I don't normally like platform games but this game is one of the few exceptions. It's a good game, but not exactly deserving all the praise it gets. I'd give it a 7/10.